overall: 27.9 x 32.7 x 16.5 cm (11 x 12 7/8 x 6 1/2 in.) gross weight: 11 lb. 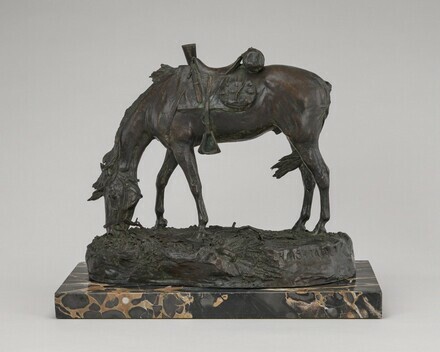 on side of base, below horse's left hind leg: H M SHRADY; beneath on lobes of four-leaf clover: H M S F[ecit]; below horse's right hind leg: COPYRIGHT 1900 / Theodore B. Starr. ; inside cavity of base: [cast no.] 2, in circle / [possibly foundryman's initials] E.W., in circle / CIRE PERDUE CAST / ROMAN BRONZE WKS / N.Y.
(Theodore B. Starr and Son, New York), 1901. Art market, New York; purchased c. 1950s by Joseph Ternbach, Forest Hills, New York; gift 1971 to NGA. 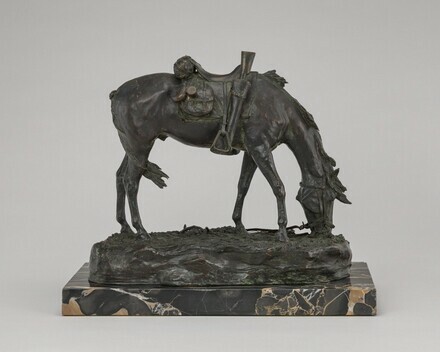 Starr, who was primarily a jeweler, was the artist's agent, and Empty Saddle was apparently cast exclusively by Roman Bronze Works on commission from Starr. Extended loan for use by Secretary Roger C.B. Morton, Department of the Interior, Washington, D.C., 1971-1974. Recent Acquisitions and Promised Gifts: Sculpture, Drawings, Prints, National Gallery of Art, Washington, D.C., 1974, no. XI, repro. Sculpture: An Illustrated Catalogue. National Gallery of Art, Washington, 1994: 219, repro. Butler, Ruth, and Suzanne Glover Lindsay, with Alison Luchs, Douglas Lewis, Cynthia J. Mills, and Jeffrey Weidman. European Sculpture of the Nineteenth Century. The Collections of the National Gallery of Art Systematic Catalogue. Washington, D.C., 2000: 469-474, color repro.